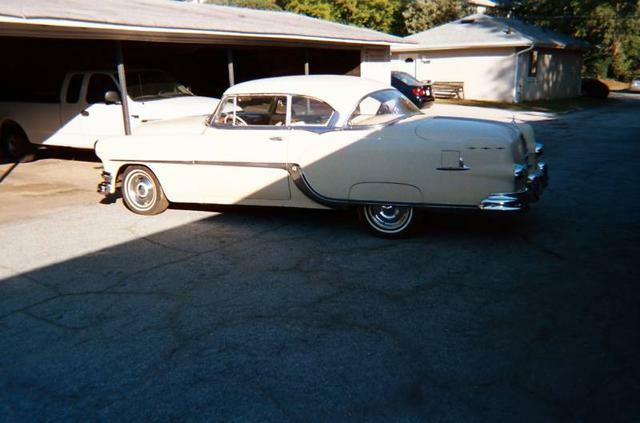 54 Pontiac Catalina Star Cheif, Top of the line Pontiac for 1954. Chrome, chrome, chrome, This car was owned by the same family since 1957. The son inherited it in the 70’s and installed a 64 421 4speed and bucket seats, probably all from a Grand Prix or Bonneville? It needs some sorting and details, but is a very solid nearly rust free car with a pretty special motor and trans. You would likely have the only one anywhere you went..........SOLD Too late again, This old hot rod will be in good company with the rest of Charlie’s collection in Huntsville along with my last 32 PB Coupe and a 52 Belvedere Hardtop.